Kaart van het Eiland Bali. 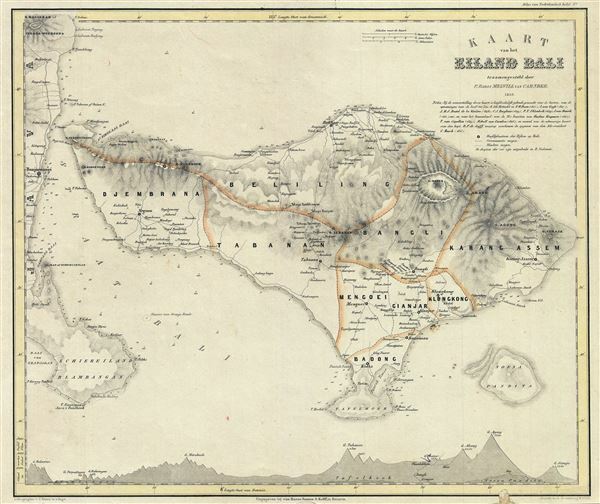 This is a scarce 1856 map of Bali, Indonesia by the Dutch cartographer Pieter Baron Melvill van Carnbee. The map covers the entire island of Bali along with Penida Island and the eastern coast of Java. The map offers considerable detail throughout, noting important cities, roads, rivers, mountains, lakes and other topographical features, with elevation rendered by hachures. Several depth soundings are also noted along the coast. The Bali Strait (Straat Bali), which prior to the last Ice Age, joined the islands of Java and Bali by a land bridge, is also noted. An elevation profile is also included along the lower border. This map was published by van Haren Noman and Kolff for issue in P. Baron Melvill of Carnbee and W. F. Versteeg's Algemeene atlas van Nederlandsch Indie. Haren Noman en Kolff, Algemeene atlas van Nederlandsch Indie door P. Baron Melvill van Carnbe´e en W.F. Versteeg, Batavia. Very good. Minor overall toning. Some wear and verso repair along bottom margin. Minor worm holes in lower right quadrant.